Can Clinton, Envoys Rebuild U.S. Diplomacy? To understand the scale of the challenge facing him as President Obama's envoy to promote U.S. interests in Afghanistan and Pakistan, Richard Holbrooke might consider the story of Amjad Islam. Islam, a schoolteacher in Matta, Pakistan, refused to comply when local Taliban leaders demanded that he hike up his trousers to expose his ankles in the manner of the Prophet Muhammad. The teacher knew Muslim teachings and had earned jihadist stripes fighting Soviet troops in Afghanistan in the 1980s. Their edict was wrong, Islam told the Taliban enforcers; no such thing had been demanded even by the Taliban regime in Afghanistan in the '90s. The scuffle that resulted left Islam's body hanging in the town square. To drive home their warning to the locals, the militants also shot the teacher's father. Whereas Pakistan was once seen as the key to fixing Afghanistan, these days it's starting to look like an even more serious security crisis in itself. According to a report released by the Pakistan Institute of Peace Studies, a terrorism monitoring organization, last year 8,000 lives in Pakistan were lost to suicide attacks, terrorist bombings, Predator drone attacks and military operations against militants  some 600 less than the lives lost in Afghanistan, a country at war. And the government in Islamabad appears unable to respond effectively. Pakistan's government, in fact, is in a precarious position, with the military having set clear limits on how far it will subject itself to civilian authority and a restive public buffeted by militancy and economic woes. A Gallup International poll conducted in Pakistan last fall showed President Asif Ali Zardari enjoying only a 19% approval rating, two percentage points higher than that of his predecessor, Pervez Musharraf, just before the general stepped down. And that was the situation before the government was forced to apply for a $7.6 billion loan from the International Monetary Fund (IMF) in order to avoid defaulting on its debt  a loan that stipulates an end to subsidies and an increase in taxes, which could further diminish the government's popularity. For now, the IMF loan has helped stabilize the economy, but the Pakistani rupee has been devalued by almost 20 points in the past year. The challenge facing Holbrooke is underscored by two Predator drone attacks on villages in North and South Waziristan on Friday that killed some 15 people, dashing Pakistani hopes that the Obama Administration would end the U.S. attacks on militant targets inside Pakistan, which Pakistani military spokesman Athar Abbas calls "counterproductive." There have been more than 30 such missile strikes in Pakistan since last August, and U.S. officials say they have eliminated several top al-Qaeda leaders. But Pakistan considers the strikes a violation of its sovereignty, and the accompanying civilian casualties have become a potent anti-American rallying point. Despite Pakistan's official opposition to the strikes, senior officials have indicated that the authorities there may have provided intelligence in some instances. The suspicion of such complicity only further enrages the Pakistani public and undermines public trust in the government. For example, two key Taliban commanders in South Waziristan, Maulvi Muhammad Nazir  who helped the Pakistani army mount an attack on his tribal rival, Pakistani Taliban commander Baitullah Mehsud  and Hafiz Gul Bahadur have nonaggression pacts with the Pakistani army. The military defends these arrangements on the grounds that it is unable to operate in areas where there are "hostile tribes" like Mehsud's and that it is prioritizing offensives in other parts of the border region. Some are unconvinced. "It appears that unless the militants are attacking Pakistani forces, the army doesn't consider them a problem," says one senior Western diplomat. Holbrooke's unenviable task, then, will be to persuade Pakistan's security establishment to abandon such accommodations with Taliban militants operating on their territory and to reorient itself away from preparing for war with India and toward counterinsurgency at home. Tackling the Kashmir issue would be a start, but that's more easily said than done. India has long rebuffed the principle of international mediation on what it insists is an internal issue. As long as the question of where Pakistan's and India's borders are drawn remains a point of potentially hostile contention, Pakistan's ambiguous relationship with Islamist militancy is likely to continue. 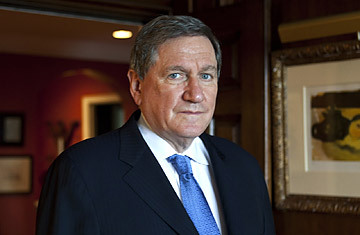 While negotiating the Dayton Accords in 1995, Holbrooke earned the nickname "Balkans Bulldozer" for his confrontational approach in bringing the warring leaders of Bosnia to the negotiating table. If anything, Pakistan may prove a more daunting challenge. See pictures of Barack Obama's Inauguration.